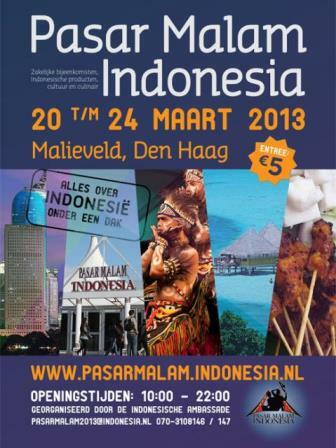 I have kind of insider's information about this event, as my boyfriend's parents are Dutch/Indisch, born in Indonesia. The original Pasar Malam was founded by the first generation of Dutch Indonesian ("Indisch") who came over from the former colony in the 50s. It was an occasion to meet friends and family, remember the good old days, play some indo-rock and enjoy delicious food cooked by the various Tanten (Aunties). Over the years however, the Pasar Malam has become more and more commercial and it has lost that "longing" charm that the first editions had. It has now changed its name to Tong Tong fair. According to John (=bf) however, the newly established Pasar Malam Indonesia has a more authentic feeling giving interesting insights on how the country is today. Check out the music programme: among the most popular Indonesian contemporary pop stars have been playing here. Also, try the real Indonesian dishes on sale, some of them very different than their watered down Dutch incarnations.